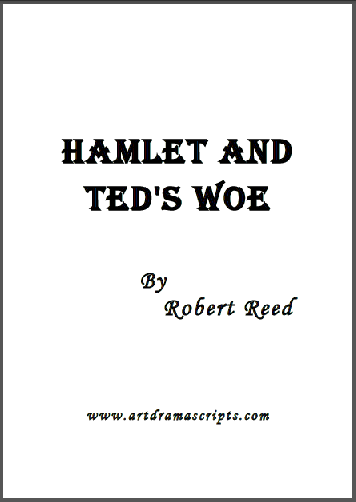 The play "Hamlet and Ted's Woe" is a parody of Shakespeare's Hamlet which incorporates comedy, suspense and action all into an exhilarating play. I love this play and that's why I turned it into a comedy-parody for kids. Two of the key themes of the play are madness and revenge. Hamlet was an instant hit in Shakespeare's own time and has retained its popularity ever since. It was loosely based on the legend of 'Amleth' as recorded in the thirteenth-century. The lead role was written specifically for Shakespeare's friend and top actor of the day, Richard Burbage. Famous actors still relish the prospect of playing Hamlet on stage, for example Jude Law. If you need to do some research on Hamlet and aren't sure where to start, I recommend visiting http://www.enotes.com/topics/hamlet . Did uncle Claudius really kill Hamlet's father? Is the ghost even haunting the right castle? Some original Shakespearian language is used, but in a manner that is accessible to all. Elsinore Castle is visited by a ghost appearing to be that of the former king. Hamlet's been miserable ever since the death of his father. After talking with the spectre, Hamlet embarks on revenge against his uncle, the new king. But, this ghost seems extremely confused. Did uncle Claudius really kill Hamlet's father? Is the ghost even haunting the right castle? Read the play description above.